I love traveling a lot and capturing excellent sceneries and emotions in a camera. This was my passion from childhood. After i got a job as software professional in the starting of my career, i have decided to save money and buy a very good digital camera with all nice features. Time has come to buy my dream camera :). Have done a lot of research in internet, read many reviews and at last selected one from Sony. 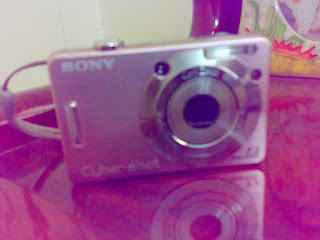 It is Sony cybershot W55 in unique pink color, 7.1 Mega pixel with 56 MB internal memory, 6.2 cms LCD screen and 2 GB memory card. I made my friend to buy the camera in US and get it for me. I was very happy, as it was the first big thing that i bought with my salary. I went to a resort one day with my family. By mistake, my camera fell into water :( Mistake was mine only. i wanted to take photos in water too, but i don't know swimming , so couldn't balance and dropped it. I searched for Sony service centers in internet. I was still confident that i can repair it and use it again. I was ready to spend any amount to get it repaired. Hurray!! i got it repaired. :) Another phase of photo sessions started with enthusiasm.